In his first six quarters this season, Fitzpatrick has completed 35 of 47 passes for 688 yards. He's on pace to throw for 542 yards against the Eagles. True with Goedert, but I too was expecting maybe just a little more involvement with the WRs thin at the moment. @Jon... Gibson was playing against starters in the preseason. If they actually game planned a few plays for him he might surprise ppl. Where is Carter? Doug is really game planning for Akine/Perkins really? I get Goedert is a rookie but we need him and Ertz to step up. Jay Ajayi back...and back in style. 20 yards on first carry in half. Still no Jason Peters. Eagles going with H. Vaitai at left tackle. Good run to start the second half. I'm usually not that bad at figuring out what the preseason means or doesn't mean. The fact that Dallas Goedert has no role in this passing attack is amazing to me. D. Pederson goes for 4th and 4 from 49. I like it. I thought Ertz got that first down. Of course, the Barbers don't think so. Still like the call. That's a reasonable conversion at midfield. Thought he did, but I think the knee was down like they said based on the replay. What is Peters out with? Think he was out before I joined in the chat. Might be related to the heat, but I don't know for sure. And Sproles is inactive right? Did he get injured in practice? He was declared out on Friday. http://www2.philly.comThere were no surprises on the inactive list. 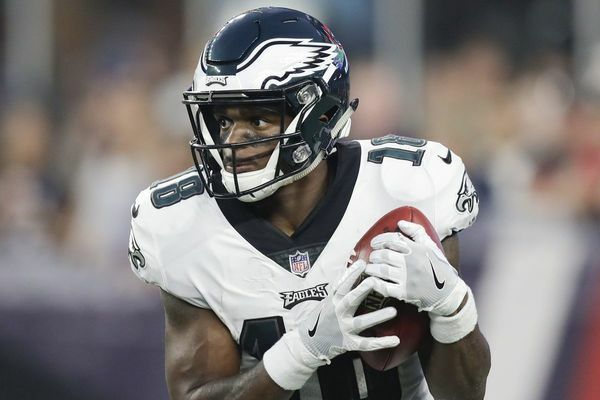 Carson Wentz (knee), Alshon Jeffery (shoulder) and Darren Sproles (hamstring) are all inactive, but they were all declared out on Friday. Playing against the second string Bucs secondary and no one can get open. Next year's wish list. A true number 1 wide receiver. Fletcher Cox is down and getting look at by #Eagles trainers. Cox is now walking off without assistance. ...And he walks off on his own. From the palms up Darby reaction I infer he should have had help there? Desean Jackson is the Philly sports equivalent to Jayson Werth in baseball. And to think, I was looking forward to this game. Go Phillies! It is just one of those days when the Eagles don't have it. We were pretty lucky we didn't have a clunker last year. These type of games happen. TD, Bucs. They're about to take a 27-7 lead. That third and 7 might have been the Eagles' last stand. Tell me again why Jalen Mills is so highly thought of? I think I'm following RealMikeC's lead. Someone in the league knew what they were doing scheduling the Eagles for a September game in Tampa. This game's over. Guess I'll watch Gilligan's Island reruns instead.